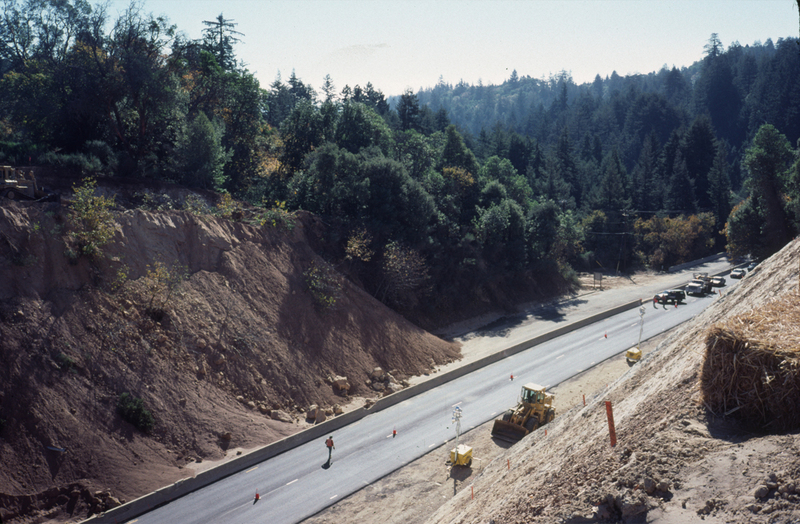 Highway 17 work at Summit Road overpass following the Loma Prieta Earthquake in 1989. Since this is the season for road closures, I thought I’d list all that I can remember over the past four decades. Highland Way – Too many years to list them all. It’s closed every few years due to mudslides, and a couple of times due to forest fires. Around 2000 it was closed for months. We had the road to ourselves, but clambering over a vertical slope wasn’t my idea of fun. Old La Honda Road (west) – Closed in 2017 and now. That’s all I can remember. When it was dirt, until 1986, I don’t recall any closures. Hwy 84 Niles Canyon – In 1983 it was closed for a short time after a mudslide. We rode through and enjoyed this beautiful canyon minus cars. Mt. Hamilton Road – It was closed in early 2017 for several months due to storm damage just before the summit of the first climb about a mile before Grant Ranch Park. When there’s a heavy snow the road is closed briefly. It didn’t used to be that way. In the mid 1980s the authorities started closing the road at Grant Ranch County Park. Skyline Boulevard – 2016 just southeast of Castle Rock State Park, and now two miles east of Page Mill Road. The 2016 closure lasted nearly a year. Heavy rains washed out the road. Gazos Creek Road – Not a car road since the 1960s, but in 1982 one mile of dirt road washed away from heavy rains. We were there on our bikes. Epic ride. Summit Road – After the 1989 Loma Prieta Earthquake, Summit Road had issues with broken pavement. I don’t recall if the Hwy 17 overpass was closed, but there was some activity on the highway after landslides. Alpine Road (east) – Starting in the mid-1980s the road had major slides from plugged culverts, mostly. San Mateo County stopped maintaining the road in 1990 and today is in the process of officially abandoning the road after nearly 130 years. Alpine Road west of Skyline has had very brief closures. Pescadero Creek Road – Closed briefly March 4, 1983, to clean up a mudslide near Loma Mar Store. Highway 84 between Woodside and Skyline Boulevard – Every few years a tree will fall and in the 1980s and 1990s the road had mudslides that closed it temporarily. Highway 84 west of Skyline had a few brief closures in the 1980s after mudslides a couple of miles east of La Honda. Highway 9 (north) – It has closed for brief periods over the years, 2017 and 1983 for sure. Mudslides and downed trees are cleaned up quickly since the road has lots of traffic. Of course, snow sometimes closes the road, along with Skyline Boulevard. Redwood Lodge Road – Closed in 2016 after the road washed away near Laurel. Still not repaired. Schulties Road – Closed in 2016 after a section of road washed out near Laurel. Still not repaired. San Jose – Soquel Road – Closed near Amaya Ridge Road for months in 2017 after heavy winter rains. Zayante Road – Closed briefly at the upper end in 2017 due to mudslides. Bear Creek Road – Closed in 2017 due to mudslides and repairs. Highway 236 – Closed in 1982 due to mudslides. Mountain Charlie Road – Closed for a few weeks in 2017 to fix a slide. Calaveras Road – I only mention it because it’s a vital route for the 100-mile Mt. Hamilton loop ride. It was closed in 2016 due to mudslides and ongoing dam construction issues, finally opening a month or so ago. 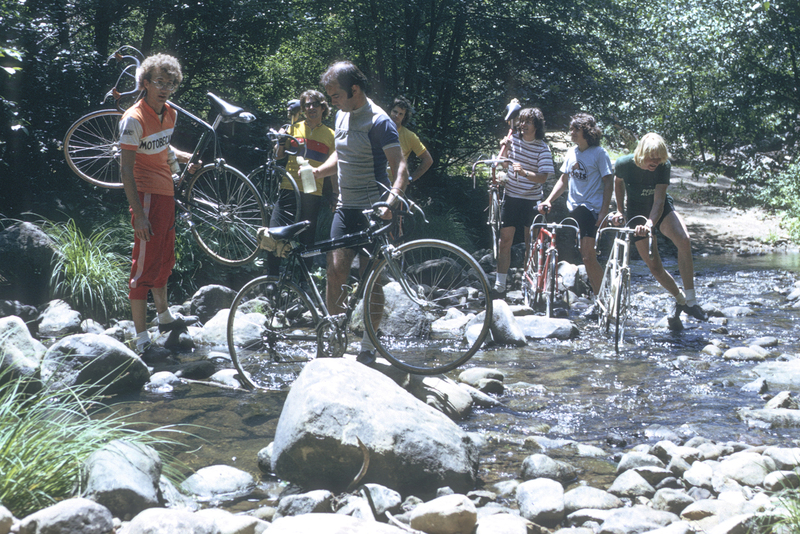 The road also had a washout/closure in 1986 at a creek that runs into Calaveras Reservoir. We had fun riding on the closed road. Roads that haven’t closed, as I recall, include Page Mill, Montebello, Kings Mountain, Tunitas Creek. 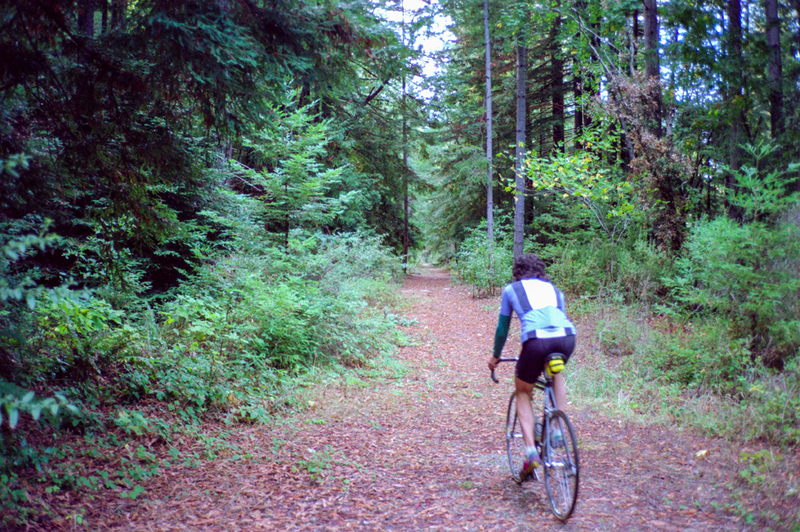 Old La Honda Road (east) might be on the short list as well. I don’t have a record of riding there when it was closed. Pipeline Road overlook, with Santa Cruz in the distance. 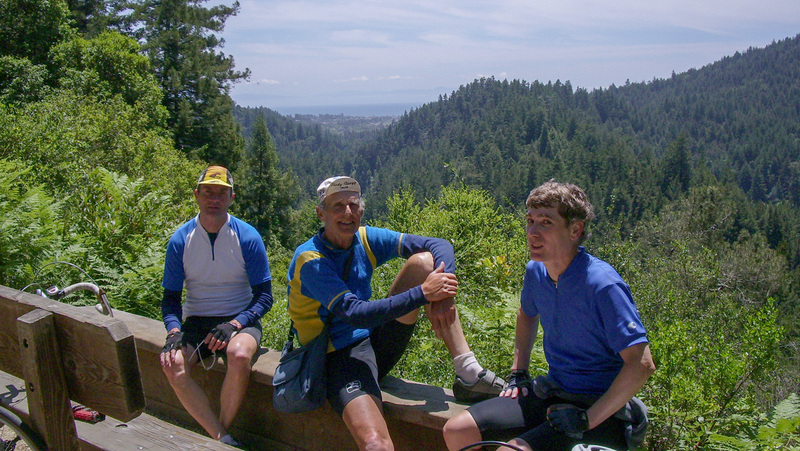 Once upon a ride, May 28, 2006, on a fine spring Sunday, Jobst Brandt led us onto a trail deep in the redwoods alongside the San Lorenzo River. 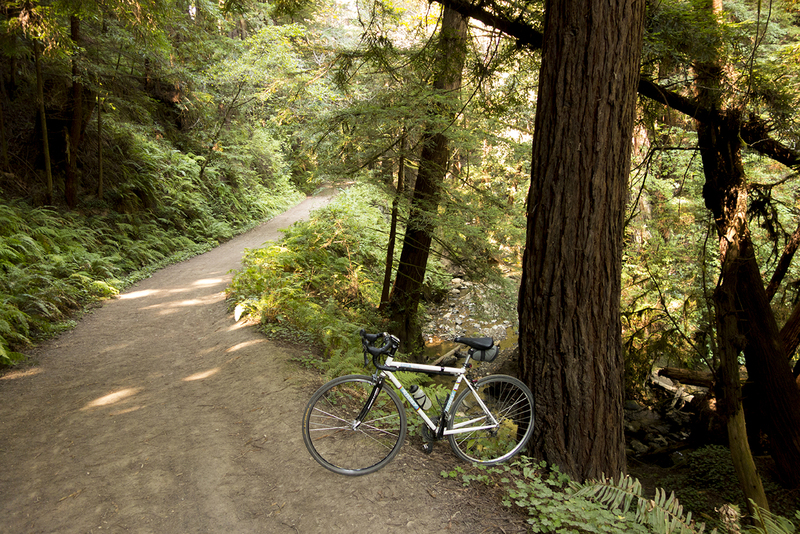 It took us from Graham Hill Road over to Highway 9 and Henry Cowell Redwoods State Park. So-named Pipeline Road headed down, paved at times, past an overlook where we stopped to drink in the view of the blue Pacific and Santa Cruz shimmering in the distance. It was a magical moment. Little did I realize that only a short distance away, California Powder Works made gunpowder in the late 19th century. The company supplied the transcontinental railroad (Summit Tunnel and other tunnels), and just about every other public works project out West. At one point they installed some heavy-caliber naval artillery to test the powder. That must have been quite a boom coming from the canyon. Heard for miles around no doubt. Everything from those times is gone — the tunnel, the flume, and the dam to supply water vital for the manufacturing process. One historic artifact still standing is a covered bridge spanning the San Lorenzo River. Most workers lived in company housing, in what is now Paradise Park. We exited onto Hwy 9, bypassing the narrow parts of the road leading out of Santa Cruz. It’s history worthy of a novel, Powder Works. In the “works” right now. National Automobile Club map from circa 1937. Thanks for jamesRides for pointing out some interesting history of Montebello Road, which has become a popular cycling route. Not all roads are county, city, or state owned/managed/right of ways. Montebello Road and parts of Stevens Canyon Road were always on private property. I’m not sure when Santa Clara County took over maintenance and established a right of way on these two roads. However, just because a road isn’t government maintained, etc., doesn’t mean it is not a public road. The way a road becomes “public” is through a pattern of use established over time. The original owners of Montebello Road and Stevens Canyon Road probably saw no need to barricade their roads back in the day. The population was small and their neighbors were farmers and ranchers. Things changed with the rapid growth of industry starting in the 1930s. By the 1950s, people had free time. The more adventuresome took up off-road motorcycling. Those abandoned iron gates, still visible in Stevens Canyon, were the result. There’s more history of the Black Mountain area in Wikipedia. Even better, a company called ArcGIS has made available most, if not all, USGS historic maps online. It’s easy to use and lightning fast to load maps, which can be downloaded. My contribution above is a National Automobile Club map from circa 1937. There’s no date on the map other than 61237 in small numbers. 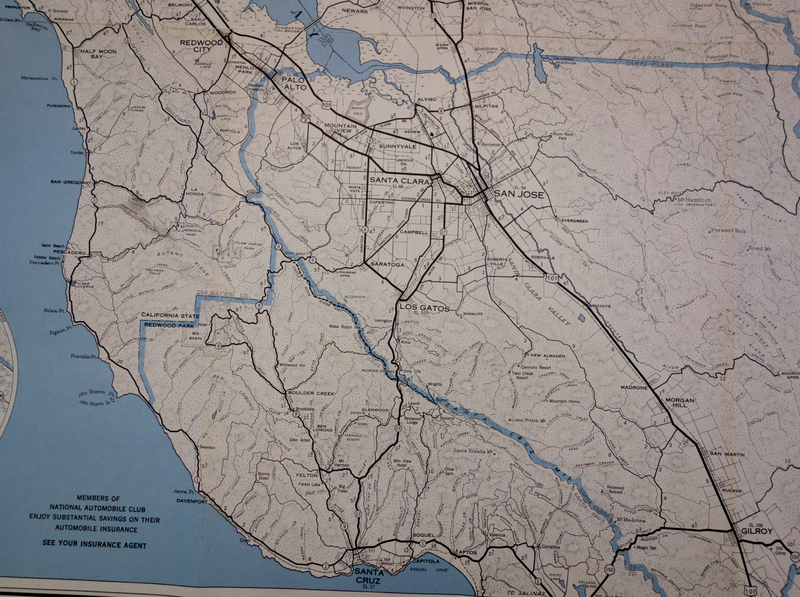 It could be 1937, although Stevens Creek Reservoir is not shown, built in 1935. Last Chance Road in 1975, crossing Waddell Creek. Bud Hoffacker, in back, and Bill Robertson, far right. As you grow older, you begin to think about unfulfilled dreams, like bike rides on roads that do not exist or are off limits. I’ve compiled a long list, but these gems rise to the surface. At least we can dream about what might be. Some of these roads might come to pass, but too late for me. Niles Canyon Trail. I stopped riding through Niles Canyon a couple of years ago. I’ve probably ridden it 30 times, and each time I swear is the last. The good news is that there’s a way to build a recreation path through the canyon, and county officials have expressed their support. It’s just going to take money. It will happen, in a couple of decades. My guess. Bear Gulch Road. Why, why, why did San Mateo County give up on this gorgeous road? It’s another version of Old La Honda, only it goes to the Pacific Ocean, almost. I’ve ridden it on the east side a few times, on the west side only once. Old Cañada Road. Most people don’t realize there’s an old Cañada Road, hidden away in the San Francisco Watershed. It goes from Edgewood Road to Highway 92. But there’s more. It’s a short hop on Hwy 92 to access roads into the San Francisco Watershed north of the highway. 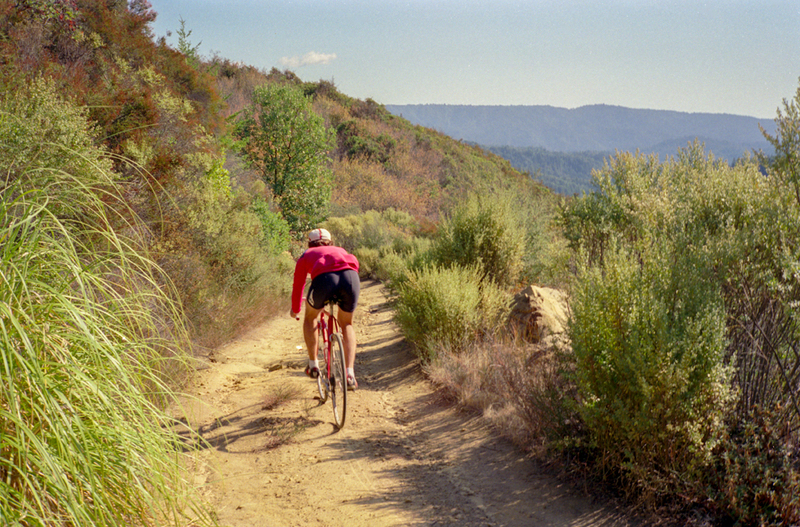 I’ve ridden Old Cañada a couple of times, the watershed, just once. It’s magical, delightful, inspirational, beautiful. Sigh. Loma Prieta Road. It spans the wild and scenic countryside between Mt. Umunhum and Summit Road in Santa Cruz County. The views from up there take your breath away. I’ve ridden it about 16 times since 1980. MROSD owns a lot of the road. The agency promises to open it one of these days. I’m guessing it will be open for bikes 30 years from now. What’s so frustrating is that the MROSD signs are already posted along the way. South Pacific Coast Railroad right of way. 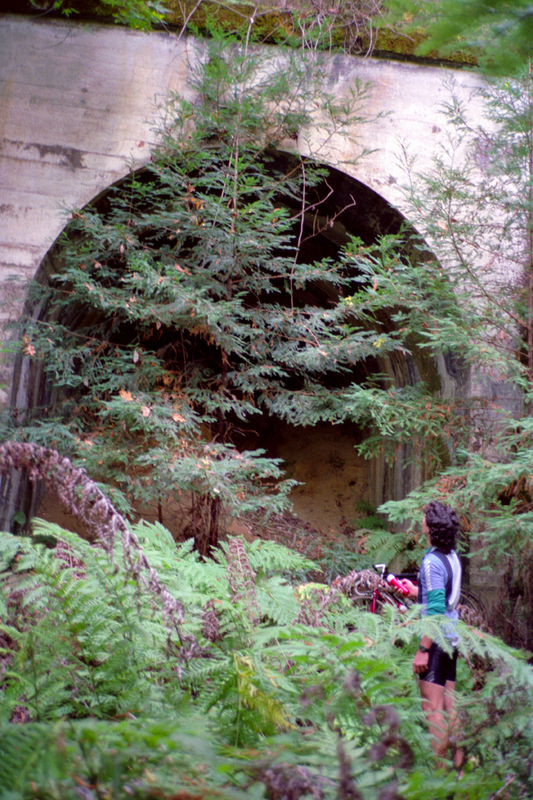 The tunnels that cut through the Santa Cruz Mountains were blasted shut in 1942 by Southern Pacific. I often dreamed about those tunnels when climbing steep grades on the way to Santa Cruz. 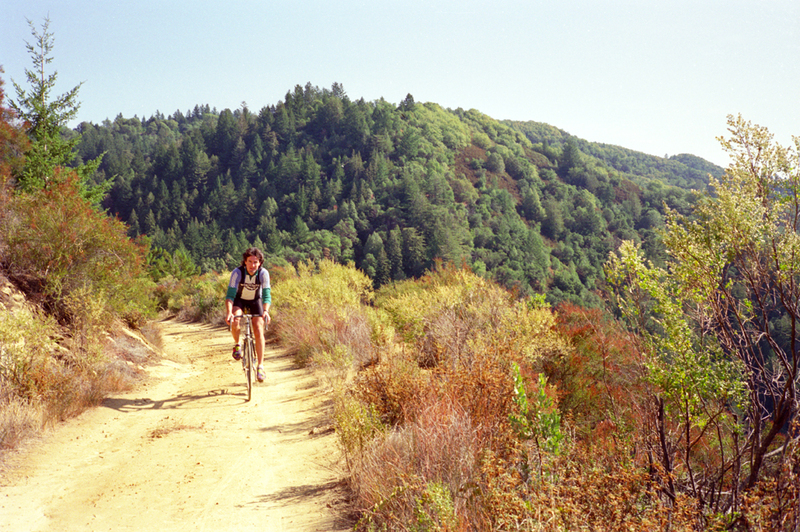 It’s such a tragedy, but the Santa Cruz Mountains can be a harsh mistress. Mill Valley to Fairfax. 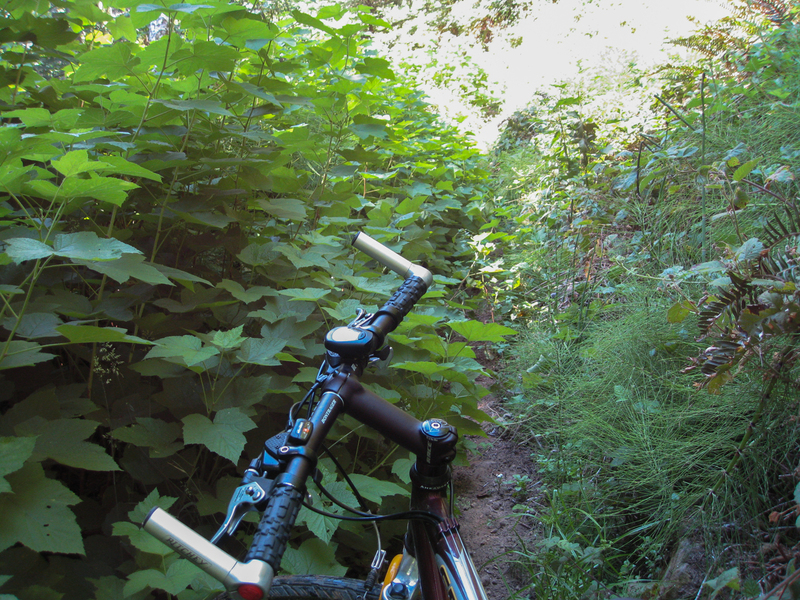 Sure, mountain bikers can make the trek, but it’s a grind. Widen Camino Alto/Corte Madera or build a nice paved trail for the road riders. So frustrating. Last Chance Road. Still doable between Big Basin Redwoods State Park and the Pacific Coast, but it’s not legal and it’s a narrow trail today. I’ve ridden it about 20 times and watched the road degrade into a wisp of a path. It’s much better than taking Highway 9, but what isn’t? Highway 9 from Felton to Santa Cruz. Speaking of Highway 9, it’s about time something was done to make cycling safer between these two towns. If only the railroad right of way would accommodate bikes. I’ve ridden lower Hwy 9 maybe 20 times, but each time I swear will be the last. Alpine Road. I’ve ranted about the loss of Alpine Road (east) for years. It’s still rideable after a fashion, but I like to remember it as it was in 1990, the last time San Mateo County graded the road. So many great memories riding up Alpine. Diablo Road. This is the only route available for accessing Mt. Diablo’s South Gate Road from Danville. Is it too much of an imposition to give up a few feet of land for a bike lane? I guess so. The road is way too narrow for today’s traffic. Highway 92. There’s no shoulder for three miles to Half Moon Bay. I rode it in 2010 on a weekday, thinking it would be better. Big mistake. Garbage trucks ply the road. On a weekend it’s a parking lot all the way to Interstate 280. A shoulder would help, but the best option to visit Half Moon Bay is to take the Coast Highway from the south. Residents refuse to widen the road, not even for a bike lane. Last Chance Road in 2011. That little thread of dirt is the road, such as it is. I head down upper Favre Ridge in fall 1994. Jeff Vance photo. 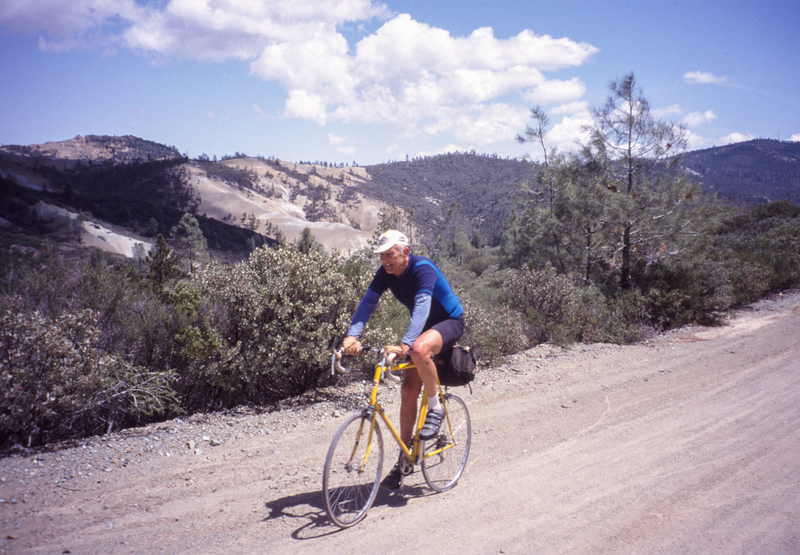 Back in 1994, almost 23 years to the day, I went on a ride that can only be described as “epic,” covering new roads, where the Bear Fire is located, and exploring a train tunnel from the previous century in a remote forest. Fire fighters say the Bear Fire terrain is steep and remote. That’s an understatement. Having studied a topo map (no Internet back then), I suggested to Jeff Vance that we try riding down through Las Cumbres, a secluded housing development off Skyline Boulevard south of Castle Rock State Park. We rode down a steep paved road and then got onto a dirt road (Favre Ridge) that was unsigned and didn’t look like it had been used in eons. At that point we were just letting gravity guide us. I figured as long as we kept riding south we’d wind up on Bear Creek Road eventually. Jeff Vance follows on upper Favre Ridge. The road was steep at first but then gradually got less so as we descended into the bowels of Santa Cruz Mountains, swallowed up by redwoods, oaks, manzanita and dense brush. At the time there were few houses and they were concealed up long driveways. Eventually we wound up on Bear Creek Canyon Road, near where the Bear Fire originated, and from there climbed through the dust to Bear Creek Road. But the fun had just begun. We continued over to Hwy 9 and rode up Zayante Road where we would search for the long lost Mountain Charlie tunnel, built for the South Pacific Coast Railroad in 1878-79. It’s not a long tunnel, but a strategic one as it dropped trains into the Zayante Creek drainage where they linked up with the Felton-Santa Cruz line. I knew the general location of the tunnel, but finding it was no easy task. We got onto the railroad right of way that followed the creek, but it was covered with fallen trees and poison oak. 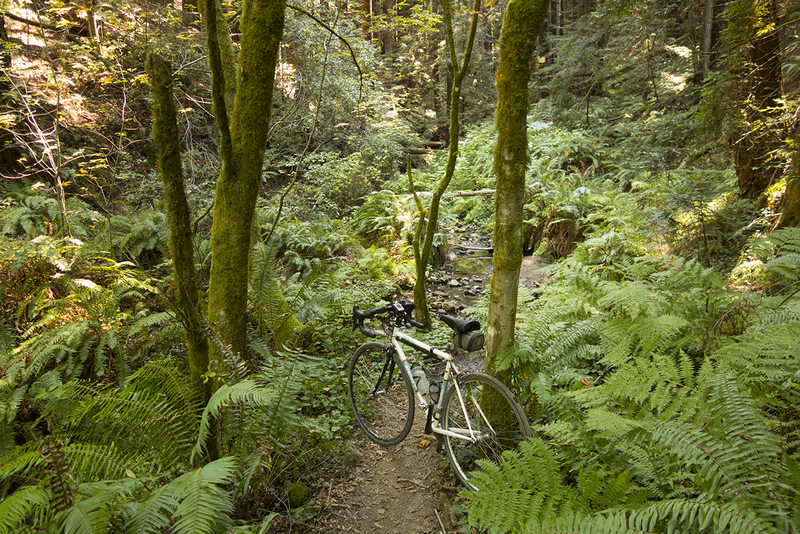 We picked our way through for a mile before finding a rideable right of way deep in the redwoods. From there the ride went smoothly (following a gentle grade) and before long we were staring at the tunnel entrance, lined with concrete and the year “1909” pressed into the arch. The tunnel was reinforced after the 1906 quake by Southern Pacific Railroad. South Pacific right of way near Mtn. Charlie tunnel, in remarkably good shape. We clambered into the tunnel as far as we could go and peered into a black abyss. The tunnel, and others, were blasted shut in 1942 for safety reasons after the railroad was decommissioned. A cave-in made any exploring out of the question. Not wanting to backtrack, we followed a road uphill that eventually took us to Mountain Charlie Road. We had to ride right by several houses, but it was our lucky day. We continued back home via Mountain Charlie Road. Jeff checks out the tunnel entrance. Looking back, the Las Cumbres route never became a regular ride for various reasons, mainly because it didn’t go anywhere interesting, the view was unremarkable after the first mile and it was not a “friendly” area. The Mountain Charlie tunnel, I have read, had yet another cave-in and there is a huge slide over the right of way that makes access even more difficult than it was. With age catching up to me, it’s just as well. The history of the South Pacific Coast Railroad tunnels has inspired me to write my second full-length novel, a continuation of my first, China Grade. The main character, after working on the transcontinental railroad, is hired to help build the Summit Tunnel (#2). The novel is called Wrights. Available in 2018 on Amazon.com. Acorns are best left for the squirrels. We’ve all ridden through oak-covered hillsides in the Bay Area, but I’ve always wondered if the acorn could be a delicious food source, so with a lot of free time these days I decided to find out. I’ve eaten Miner’s lettuce, Chanterelle mushrooms, Thimbleberries, and other wild foods, but I’m hardly a survivalist. If we ever have one of those events leading to a dystopian future, I’ll be the first to go. Gathering acorns is the easy part. They’re everywhere. I picked up some in a nearby park as the squirrels chattered away in the trees, watching their food source disappear. I followed the process recommended by Arthur Haines in his YouTube video. He recommends cold-water leaching of the tannin, the stuff that makes acorns poisonous to most animals. I didn’t see the point in drying the acorns in the sun, as recommended, and besides, it was raining. Probably not a good idea. They should be dried. I used a claw hammer and a flat stone to smash the acorn (lying on its side) to get to the nut. It took at least two hours of pounding. I thought about the indigenous people who used to do this all the time and thanked my lucky stars for Costco. Then I had to grind the nuts into a fine powder before leaching. Leaching took a week of twice-daily emptying water-filled mixing bowls with ground acorn. On the eighth day the water was clear except for a slight color tinge, so I knew the tannins were gone and I wouldn’t die. Then I had to dry the acorns. On a cold winter day that can take a while, so I used a space heater. Finally, I used the acorn mix to make waffles. I figured, one cup of flour and one cup of ground acorn would do the trick. No, the acorn is more like ground nuts, not flour. I had to add another cup of regular flour. The verdict: Acorns don’t have much taste, if any. Think sawdust. The lesson here is simple. Good foods are popular. Acorns don’t make the grade. That’s why you only see them being eaten by survivalist types. Same goes for buckeyes, only they’re even harder to prepare and taste like bland potatoes. OK squirrels, you can keep your acorns. Follow-up: I tried it as coffee. With sugar and half-and-half, yum! The Southern troops drank acorn coffee in the Civil War. Holy roadblock Batman! Ewert Road is closed starting Wednesday, Feb. 3, through the 10th, no doubt for the Super Bowl. In case you had never heard of that road, it’s what we all know as the frontage road around Mineta San Jose International Airport. I noticed the sign on my Monday ride, after I checked out the Super Bowl 50 venue via San Tomas Aquino Creek Trail. Needless to say, I was being watched the entire time as two helicopters chopped the air overhead. Don’t even think about going near the stadium the rest of this week. Only way to get a bike through is if you’re an undercover FBI agent. All routes are blocked. I used Lafayette to reach Alviso. I remember riding through Palo Alto during Super Bowl XIX back in 1985. It was a nice day, high of 59. The game didn’t start until late in the day, so I had no issues with traffic to speak of. How times have changed. 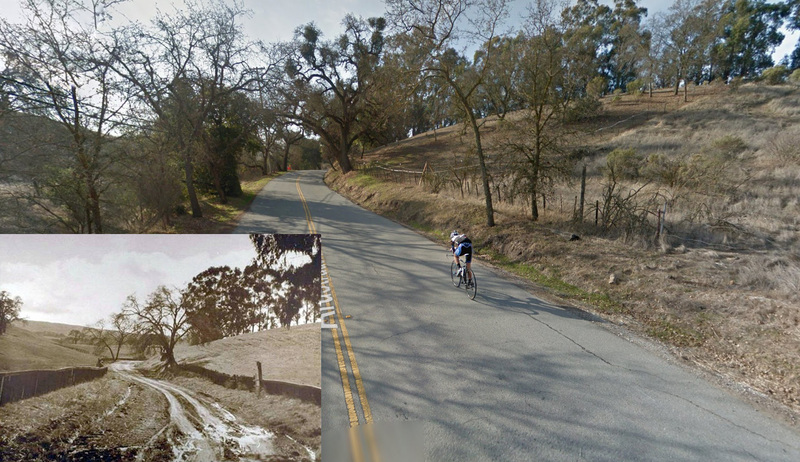 Arastradero Road in 1930, inset, and today. Rooting around in the Palo Alto Historical Association online archive, I found this image taken by Kenneth Merckx (Eddy’s distant cousin) in 1930. Here’s the same location, exactly, today using Google Maps. It’s a lot more civilized these days.